In many neighbourhoods, 2-4 hour open houses on a sunny weekend afternoon tend to do the best. But every neighbourhood is different, and your real estate agent should have the experience to know what will do well in your area and what won't. If a property is desireable enough, buyers will come out in the pouring rain for the chance to get a showing. Check the weather forecast. If it looks like rain, make sure visitors have somewhere to put their wet coats and boots. Make sure your open house doesn't conflict with any holidays, local celebrations, or major events (like the Stanley Cup Playoffs). Note any areas that need putty or plaster, repainting, or new wallpaper. If you're picking a new colour to repaint in, neutral shades tend to be more attractive to buyers and can make a room look larger. If there's any excessive wear or damage, ask your real estate agent about how you should handle it. Clean up any dirt and remove any stains, including fingerprints, scuffs, and tape residue. If you have carpeting, consult with your real estate agent on whether to replace it. Replace any chipped tile, and sand any noticeable chips in wood flooring. If you have linoleum floors, sweep, mop, and wax them. If you have hardwood or tile floors, vacuum and go over them with a damp mop. Put away any bathroom rugs: removing them will make the floors feel more spacious. Shake out any remaining area rugs and give them a wash.
Make sure stairs are free of clutter that visitors might trip on, and polish the railings and banisters. Test all fans and repair any that squeak, rattle, or are noticeably loud (especially in the bathroom and kitchen). Dust any ceiling fans and turn them on to a low-speed setting before the open house. Slowly rotating fans can create a relaxing mood. Touch up any chips, scuffs, or faded paint jobs on doors or windowsills. Check that all doors and windows open and close securely without squeaking. Make sure that all locks, latches, handles, and electrical switches work properly. Replace or repair any screens with holes in them. Take down any custom, antique, or expensive lighting that you aren't willing to part with, and replace them with more standard fixtures. Dust all light covers and lampshades, and clean out any dead bugs. Replace any dead lightbulbs, including those in exterior/outdoor lights. Clean all windows, mirrors, and door glass, including frames and sills. Make sure all window coverings (blinds, drapes, curtains) open and close properly. Clean all window coverings, and replace those that are damaged or faded. Put mirrors near light sources like windows and lamps to increase the amount of light in your home. If you have dimmer lights, make sure your real estate agent is aware of them so they can show them off. Open all doors between rooms before the open house to make your home feel larger and invite people to explore. Any mailboxes or mail flaps in the entranceway should be rust-free and in good shape, with no squeaking. Put clutter like extra shoes, purses, pet leashes, and umbrellas into storage. Hang coats and jackets neatly, and store, stack, or line up boots and shoes. Close all closet and cupboard doors before the open house. Make sure the welcome mat is clean and straight. Put away everything except for daily use appliances. Make sure your real estate agent has an accurate list of which appliances are going with you, and which are staying with the home. Degrease any vents or range hoods. Make sure countertops and cupboards are organized and in good repair. Ensure all appliance and cupboard doors open and close properly and securely. Replace any dated cupboard handles with more modern ones. Test all appliance light bulbs and fans (including the freezer and range hood). Test the sink faucet for proper water flow, and repair any leaks or clogged drains. Use the proper cleaning supplies and polish to shine up all surfaces, including lightswitch plates, granite counters, and stainless steel features. Avoid using cleaners with strong smells (like ammonia and bleach) shortly before the open house. Use milder cleaners, or clean early enough to give the smell time to air out. Remove any spoiled food and clean the fridge, microwave, and stove both inside and out. Put away all magnets and other fridge decorations. Get rid of any crumbs, scour away any stains, and replace any old drip pans. Don't leave any grab-and-go snacks in the fridge — impolite visitors have been known to help themselves. Take out the garbage, and store the trash can out of sight in a cupboard if possible. Wash all dirty dishes and empty the dishwasher. Don't set the table. Keep all surfaces as clear and clean as possible (with the exception of an accent like a vase of fresh flowers). Arrange to eat out or order takeout the night before the open house to keep your kitchen clean. Put any extra furniture in storage to increase the sense of the room's size. Damaged, stained, or highly personalized furniture (like the chair with your favourite sports team logo) should go first. Make sure all remaining furniture is clean and in good repair — if you have to, use slip covers to hide stubborn stains. Vacuum up any pet fur. Remove and store any fragile items and/or personal photos. Clean and store any ashtrays out of sight. Neatly store any children's games or toys. Ensure all bookshelves are neat and junk-free. Store any clutter like remotes, magazines, and coasters out of sight. Thoroughly dust and vacuum each room, and polish all wood, glass, and metal surfaces. Don't set the table, but cover it with a tablecloth if there are stains or scars. Set out a single accent item like a bowl of citrus. Make sure there's enough room to walk around all tables and chairs. Tune your TV(s) and stereo(s) to local news stations and set them at a low volume, in case curious guests turn them on. Turn off all electronics, and make sure the TV screen is free of fingerprints. Put away any standing fans or space heaters that might imply that the room gets too warm or too cold. If you have a few small plants, set them out in strategic places to freshen up the room. If you have a fireplace, make sure it's clean and swept with neatly-stacked logs. Polish the screen and fireplace tools. During nice weather, crack open the windows for an hour or so to air out your rooms. If it's brisk outside, make sure your home has enough time to warm up again before the open house. Open window coverings to let in light and show off the view. Remove any large, unnecessary pieces of furniture and put them in storage to increase the room's visual size. Put away any clutter or personal items, including magazines, charging cables, and personal photos. Have as many clear surfaces as possible. Lay out your highest quality matching bedding. Make the bed and fluff the pillows before each showing. Store any plastic hampers out of sight and make sure all clothes are neatly put away. Make sure your closet is neat and organized. If you have the budget, installing a closet system with shelves, drawers, and hanging racks can add a little value to your home. If you have a hardwood floor, lay down an area rug and have it "flow" from underneath the bed. Hang a piece of relaxing, decorative art above the bed or across from the door. Add lamps if the room is too dim. Take a deep breath. If the air smells stale or off, crack open a window for a few hours or set up a (subtle) diffuser. Don't use strongly scented air fresheners — some visitors might have allergies or scent sensitivities. Organize all cupboards and countertops, and store personal items like toothpaste, hairbrushes, makeup containers, and razors out of sight (not just in the vanity). Put shampoo, body wash, and other shower supplies in a basket and store them under the sink or in a cupboard. Remove any books or magazines. Clean every surface until they shine, including the toilet. Make sure there are no signs of hair, mold, or mildew. Test all faucets and flush the toilet. If they leak, trickle, or drain slowly, have them repaired. Put out fresh soap and lotion, a fresh shower curtain, and clean matching towels. Replace any outdated minor fixtures like towel bars and toilet paper holders. Make sure toilet paper is well-stocked. Tie open the shower curtain and keep the toilet lid closed. Donate or dispose of unnecessary items and clutter. Organize all remaining items in boxes and neat stacks. Add storage shelves if necessary. Make sure any pet areas are clean and odour-free. Sweep up any cat litter (cat litter can break some vacuums). Put laundry products and cleaners away in cupboards or baskets. Make sure all dirty laundry is either washed or out of sight. Dust all surfaces and vacuum all floors. For garages, remove any cobwebs and check for beehives or wasp nests. If your garage floor has oil stains, try absorbing the oil with cat litter and scrubbing the stains with a degreaser to remove them. Don't have any noisy appliances like a dryer running during the open house. Make arrangements for your pets to stay elsewhere during your open house. Some buyers may have allergies, and your pet will be less stressed if they can rest in a quiet environment instead of being at home while strangers wander through the house. Put all clutter in storage, including tools, toys, personal projects, extra yard decorations, and odds & ends. Check that all outdoor furniture is clean and in good repair. Remove any dead or sickly plants, and trim and water the healthy ones (including trees). Keep all lawns, flower beds, and driveway or walkway(s) free of weeds. Fix any bald spots on the lawn. Get rid of any noticeable cobwebs, nests, or hives. Check that all gates and doors open and close smoothly. Rent a power washer to clean your deck, patio, and/or walkway(s). Repair any damaged decks or fencing, and repaint or re-stain over faded colours. Make sure all gutters and downspouts are in good repair. Seal or repair any cracks or uneven sections that people might trip on in your driveway and walkway(s). Check that any water features, pools, or hot tubs are clean, free of debris, and working properly. Clean your outdoor BBQ or grill and make sure it's clear of rust. Pick up any debris or pet waste, and keep the lawn neatly mowed. If you have a firewood stack, make sure it's organized and neat. Check that your house numbers or address plaque are in good repair and easily visible from the street. Lock up any cash, jewelry, watches, and other valuable accessories, or take them with you. Remove and hide any prescription drugs, sleeping pills, allergy medications, or other mood- or mind-altering medicines. Make sure all of your household computers, phones, and tablets are logged out and can only be accessed with a (secure) password. If you have any passwords taped to computers, internet modems/routers, or other important devices, remove them and store them somewhere secure. Remove any home assistant speakers (such as Google Home or Alexa), or turn off the "guest" setting so that they only take commands from your own voice. Put away any mail or documents that list your full name and/or other important information such as your finances or personal phone number(s). Take them to another location, or store them somewhere both hard to notice and in plain sight, like at the bottom of an unmarked cardboard box. Remove or lock up any document folders or valuable books that could be easily picked up and taken away. All keys, remotes (for garages and other entrances), and fobs should be locked away or on your person. If you keep bicycles in the garage, consider moving them to a shed or locking them together. After the open house, take a walk through your property and check that every door, window, and gate is locked — including the shed and garage. 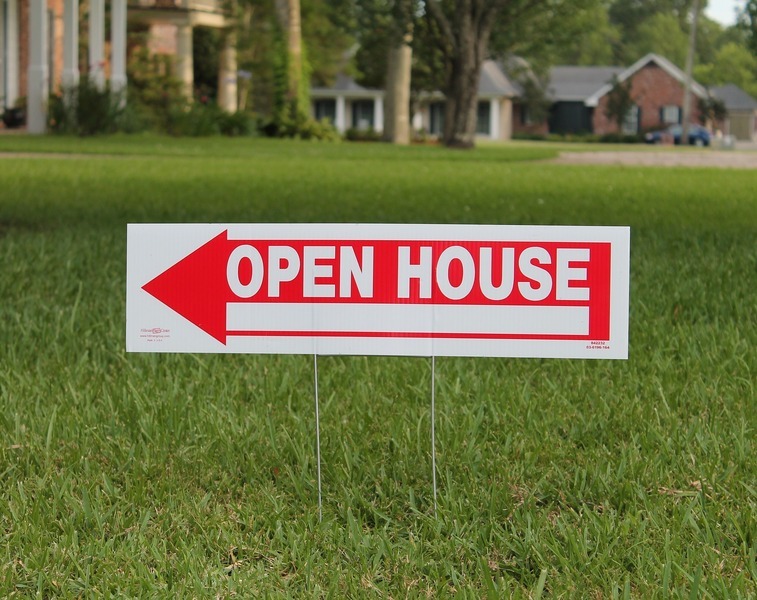 During the open house itself you can take the time off to relax, grab a coffee, or run errands while your real estate agent shows your home and answers questions. Give yourself a treat for all your hard work, and you'll come home to plenty of offers at the end of the night!